Fraud can be devastating to any business, but small business owners are especially vulnerable to the costs of financial betrayal by a trusted employee. Companies with a small staff often ask their workers to wear many hats, which results in a lack of internal controls and a loss of the natural checks and balances that occur in a large department. Small business owners need to do all that they can to be aware of the red flags of fraud so they can stop the theft as soon as possible, or prevent it altogether. However, the owner’s knowledge is not enough; every employee of a small business needs to be trained on the warning signs for fraudulent behavior and how to report them. They should also be educated on the reporting protocol (e.g., systems in place) once a fraud red flag is detected. In addition, if employees knew in advance what policies were enforced in relation to fighting fraud, imagine the change in their behavior or their perception of what could be hidden from management? For example, announcing that random audits and inspections would occur, or that vacation time is mandatory for all employees may help combat some of the temptation to commit fraud. According to the most recent Global Fraud Study by the Association of Certified Fraud Examiners (ACFE), one fraud red flag was identified in 92 percent of the occupational fraud cases they studied, and two or more behavior red flags were identified in 64 percent of cases. If these red flags can be identified early on in the fraud scheme, the damages can be reduced. Living beyond one’s means – The employee buys expensive jewelry, takes extravagant vacations or purchases new vehicles that are out of the employees’ salary range. Financial difficulties – The employee purchases everything on credit, the office receives calls from banks requesting payments taken out of paychecks, or collectors call during business hours looking for the employee at work. Unusually close association with vendor/customer – If an employee is often seen associating with a vendor or customer outside of work, take a second look at their relationship. Common fraud schemes involve payments to vendors who are actually friends. Control issues, unwillingness to share duties – Sometimes an employee does not delegate duties to others and is not willing to take any vacations, which would require another employee to see their work. “Wheeler-Dealer” attitude – shrewd or unscrupulous behavior in an employee can be a sign of someone willing to bend the rules to suit their needs. Once employees are trained to be aware of these five red flags, the next step is for them to take action. Employers should provide a way for employees to report concerns of fraud. For example, either through an anonymous hotline or through a secure comment box. If an employee identifies any of these red flags, they should report their concerns right away. On average, cases of fraud cost a business $8,500 a month and go on for 18 months before they are uncovered. A group of vigilant employees could potentially reduce the impact by shortening the length of time a fraudster is allowed to go unchecked, saving the business thousands of dollars for each month the fraud is cut short. A recent example of employee misappropriation includes an investigation performed by our firm that was based on a tip given to the owner of a local business. The suspected employee had been with the company for many years as a bookkeeper in the office. Duties included maintaining company accounts in QuickBooks, which involved handling accounts payable, payroll, recording daily deposits and reconciling the accounts on a monthly basis. Even though the suspect was not an authorized signer on the checking account, they had access to the signature stamp. Apparently, the opportunity to use the stamp proved too great for the suspect. Our investigation uncovered several schemes, which primarily included issuing checks in the perpetrator’s actual name or to Cash, and changing the payee in QuickBooks to that of a customary vendor. When interviewed and confronted with selected examples unearthed by our forensic accounting procedures, the perpetrator admitted to the schemes, and to having a gambling problem. Some behavioral red flags that should have raised suspicion included the purchase of a new vehicle, bank statements with missing check copies, and the suspect working on bank statements off premises. Segregation of duties. The reconciliation of accounts, review of bank statements and inspection of paid checks should be performed by someone that is not responsible for both check writing and having full accessibility to the accounting system. This bookkeeper was given both the lock and the key – Write a check, post it to the accounting system as a seemingly valid vendor and perform bank account reconciliations to ensure that everything balanced. Keep signature stamp in locked drawer. Only the authorized user of the stamp should have access – this stamp should be guarded as closely as cash, since ultimately it can be used to drain cash from a business’ accounts. 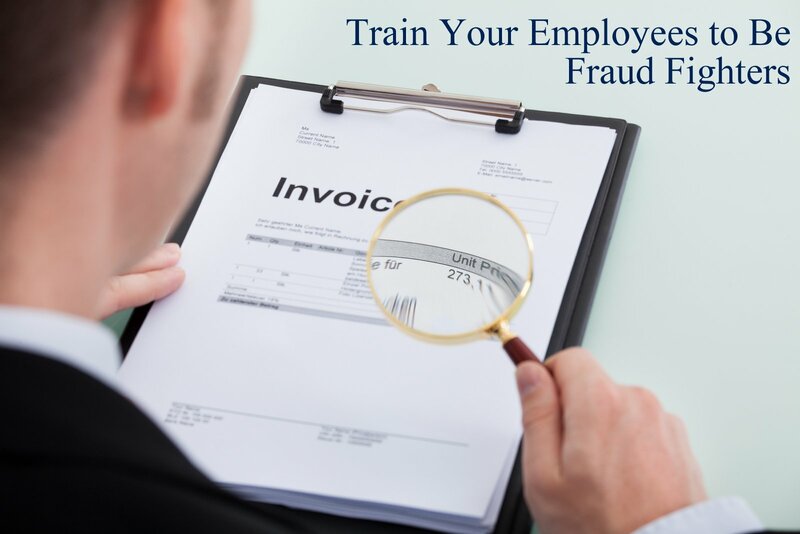 Consider these examples as motivation to train your employees to be an army of fraud fighters. If everyone is aware of the internal procedures in place to help prevent fraud and they know the five red flags displayed by the average fraudster, then they can be one of the first defenses in helping a business owner stop fraud before it causes irreparable financial harm. If a business owner receives a tip, it should be acted on immediately. A fraud examiner can then be brought in to perform an analysis of financial documents to uncover the fraud, interview the suspected fraudster and calculate the damages. Mike Rosten is a Principal at Piercy Bowler Taylor & Kern CPAs and Business Advisors. You can reach him at mrosten@pbtk.com or 702-384-1120 .